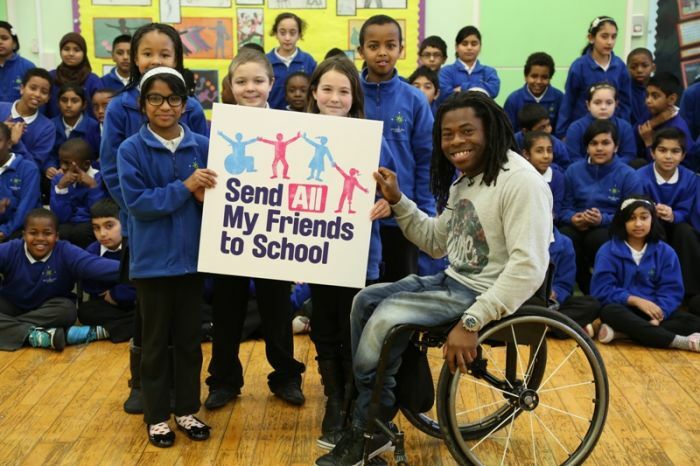 Supported by the broadcaster and Paralympian Ade Adepitan, Send ALL My Friends to School launches for 2014. The campaign invites UK school pupils to remind world leaders that it is children with disabilities that are missing out most on education. In 2000 world leaders promised universal primary education by 2015, but with only a year to go 57 million children are still out of school and over a third of them have a disability. Running until the end of the Summer term, Send ALL My Friends to School, organised by the Global Campaign for Education, is asking teachers and pupils to get creative and speak out for the right of all children, regardless of disabilities, to receive a good quality primary education. Ade Adepitan presents the campaign film which links to his own story. Ade was born in Nigeria where he contracted polio at 15 months old. Ade moved to London before he started primary school but knows that if he had stayed in Nigeria his life would have been very different. Nigeria is the country with the largest number of out of school children currently at over 10 million. A dynammic schools pack is available free to support teachers in getting their pupils involved in the campaign. Schoolchildren will first learn about the issue in class and then add their colourful messages to ‘buddies’ to speak out for the right of every child to have the right to learn, regardless of their disability. Local MPs or politicians will be invited into schools to receive the ‘buddies’ and then deliver them to the Prime Minister on their behalf. The free teaching pack, which can be used in Key Stages 1, 2 & 3, will include a campaign DVD (ideal for use in assemblies), a teachers guide, 4 colour A1 posters and ‘buddy’ templates. In addition, a range of resources will be available on-line to support the pack including assembly PowerPoints, fact sheets and real life stories from children missing out on school in Africa and Asia. The Send My Friend to School campaign has been running since 2005 – each year with a different theme – and millions of young people have taken part in the UK and in 100 countries around the world. Last year the campaign focused on the global shortage of professional teachers. Half a million young people from over 5,000 schools took part and 99% of MPs were sent colourful paper messages about the vital role of teachers in realising education for all. Be the first to comment on "Ade Adepitan inspires UK pupils to highlight that education for children with disabilities must not be forgotten"